About 10 years ago, the PBX phone held its business use territory and the cell phone was used only when mobility required it. The cell phone offered mobility, but the cost was high in both price/minute and quality compromises. It was socially accepted and expected to reconnect once the mobile user arrived at a place where a land-line was available. Not so today. Now the cell phone is our friend – quite literally we are connected at the hip. Today, it is perfectly reasonable to use the cell phone right at the desk – and more and more we give out the cell number as our primary one. The PBX has attempted to hold on to its relevance through advanced features. Increasingly, those features are being extended to the mobile phone. One turn of events could be the cellular phone industry discovers hosted PBX services and competes with the PBX. But there hasn’t been any evidence they have figured this out. Instead, the PBX makers are rushing now to embrace the cell phone as part of a VoIP Enterprise mobility solution. Currently there are two primary means of PBX/Mobile phone integration; cellular extension and FMC. With cellular extension the PBX calls the cell phone with a newer form of call forwarding. Unlike yesterdays call forwarding or ring-all features, the PBX does not hang up after the cell phone is answered. Instead the PBX continues to monitor the call for DTMF commands. The commands allow access to core PBX functionality such as transfer or three way calling. This strategy will expand to include call center features, call recording, and even conferencing services. Since the PBX stays on until the call is disconnected – it can properly report status/presence to other enterprise users (“on cell phone”). This service is available from several platforms including Mitel (Dynamic Extension) and Avaya (One-X). This model works well for incoming calls but does requires memorization of dialed feature codes. Outbound dialing is a bit more complex – the cell phone needs to establish a session with the PBX first which can be done in a variety of ways. The service is positioned as an additional cost feature and requires additional trunking capacity on the PBX. 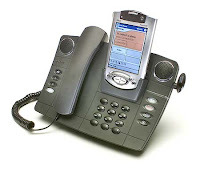 Fixed Mobile Convergence involves using a SIP phone client on the cell phone and using WiFi to access the PBX. In some situations, the call can automatically be routed back over the carrier’s wireless network when the phone is moved out of wifi range (Tmobile offers this). Though normally this re-routing is a manual process. The benefit of this solution is a single device (within a limited wifi footprint) and mobility without per minute charges from the wireless carrier. 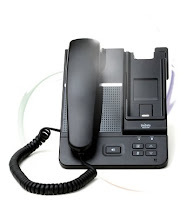 But the SIP phone features are very limited on a traditional PBX and voice over wifi has its unique set or challenges. Neither of these solutions are ideal and represent a step on a journey to a more seamless solution. The problem is that a transparent solution is not even on the horizon yet. My crystal ball is a bit cloudy, but I think the ideal solution is a hard wired phone/dock that can convert a cellular phone into a PBX extension. Mitel offered a similar concept a few years ago with their 5230 IP phone. But rather than utilize a cell phone, it used an HP IPAQ PDA. It was a clever concept that failed miserably. The idea was the Ipaq was the brains of the phone with contacts and call logs. Various dock connectors assured compatibility with multiple Ipaq models. The idea was when you are in the office, you can put the Ipaq in the cradle for charging and access its phone book for click to dial. Outside of the office, you can view the call history log to, for example, look up a number from earlier in the day. There are probably multiple reasons why the product failed, but one big one is the PDA soon died out and was replaced with smartphones such as the Treo. I recently saw another type of docking phone at Astricon. UDC Systems showed off a new wifi phone with a dock. This solution enables a video/SIP/wifi phone to become a wired phone while charging in its dock. When the wireless phone was in its base, it had a decent speaker and handset. Partnered with the SQ-3500 video wireless handset – and you have wifi/wired video SIP phone. This is getting pretty close – what I really want is a cell phone that goes into a land dock. The concept isn’t revolutionary – particularly in cars. But because of the quantity of cell phone models – no real standard has been established. I believe the answer is a cell standard that allows me to insert my cell phone into a dock at home, in the car, and here is the cool part – the VoIP PBX phone. This will require considerable cooperation between PBX and wireless carriers, but offers a unique set of capabilities – particularly if partnered with a residential base unit as well. The residential problem isn’t getting much attention at all. The landlines are going the way of the dodo, but the cell phones aren’t utilizing the house wiring. Phone jacks are in most rooms – inserting a cell phone into a base for charging could easily enable house jacks to work with standard analog phones. There are a few solutions on the market such as this one. But the bigger play is with enterprise voice. Now we are into the pure fictional part of this post. Consider a base/dock like the Unidata base above. No dial pad necessary, maybe a few keys including an emergency button. The phone in this state will be a basic internal extension on the PBX with an internal-only class of service. The primary user arrives at the office and inserts their cellular cell phone into the dock for charging (milestone one – a universal cell phone dock standard including input voltage for charging). The base recognizes the phone and becomes active for that specific user’s extension/DID (milestone two – hoteling or hotdesking based on cellular hardware id lookup). The base unit is now capable of making or receiving PBX and cell phone calls including hard buttons for hold and conference that work with either type of call (milestone three – signaling standard for common features). The phone can be removed from the base during a call and via FMC, the call is automatically transferred from VoIP PBX to cellular (milestone four FMC standard – maybe even transfer to wifi-n first). In the car, the cell phone redocks for charging and car audio speakers (milestone five – new standard for car dock/integration). Then at home, it can be inserted into a residential base which uses typical daisy-chain residential wiring to utilize analog phones throughout the home (milestone six – FMC with analog trunks) or in the case of no land-line make its cellular service seamlessly available to all analog phones in the home (milestone seven – analog to cellular bridge). There is a lot of wish list milestones there, but it isn’t anything too unreasonable. Taking the brains of the desk phone with us has been tried before and makes a lot of sense. Making our cell phones more functional while at home charging, particularly as they are increasingly replacing landlines also makes sense. Today, we mostly holster our cell phones at home. There are some hopes of changing that – consider the dock for the new Droid phone which transforms the cell phone into a residential clock and weather station while charging. Not yet married into the home phone system, but at least more use-able and could replace a travel clock. This scenario is pretty far off for lots of reasons. The PBX makers have no influence with the wireless carriers who are increasingly losing influence with cell phone equipment makers. More likely, a different reality will emerge as this one may require too much coordination among parties. However, there are no real technical limitations to this proposed reality and in fact, quite a few benefits – particularly to the end user.